Mudcat Pottery is a one-person pottery studio founded in 1994 by Darlene Yarnetsky. Darlene earned a Bachelor of Fine Arts in ceramics, painting and drawing from Bowling Green State University in Ohio. 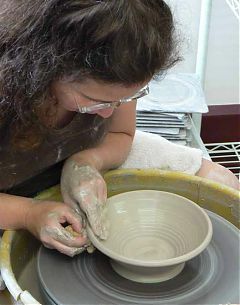 In 1994, following a studio internship, she founded Mudcat Pottery in Madison, Indiana. She participated in juried fine art festivals across the Midwest, then opened her own studio/gallery in 2002. In 2008, she became one of Indiana’s first juried Indiana Artisans. In 2010, Darlene and her husband relocated to southeast Pennsylvania, and for a year Darlene operated Mudcat Pottery in Bucks County, Pennsylvania, near Doylestown. Fate currently has us out of production and looking for new studio space.